It’s the most wonderful time of the year! Get ready to decorate your Christmas tree. Check out these 100 ideas for Christmas tree decorations and get in the holiday spirit. It’s OK to have a detached sense of humor when it comes to decorating the tree. This grinch didn’t get away but makes for a memorable Christmas tree. Find out the best day to go out Christmas tree shopping. Ugly Christmas sweater parties have gone on for the better part of two decades but DIY Candy keeps the party going with this cleverly decorated tree that features tiny ugly sweaters as ornaments. The scarves really sell it. Check out 12 great Christmas gifts for the frugal shopper. If you have leftover yarn from knit, crochet or other projects, wrap it around a foam cone to create cozy Christmas trees which are fun holiday projects. And use tacky glue or a low-temperature glue gun to secure the yarn. For added fun, repeat the process with coordinating metallic yarn or other color, wrapping lightly enough to reveal some of the base yarn underneath. Bright Idea: Want more options for trimming your yarn trees? Attach buttons, yarn or ribbon bows, beads, small silk flowers or pinecones, silver or gold charms, tiny tree ornaments or even costume jewelry. Ball ornaments don’t have to be tree trims. They can be the tree! This one hangs in a frame with a 10- x 13-in. opening. For each row of the tree, lay a piece of wire horizontally across the back of the opening. Use a staple gun to tack one wire end to the frame, string on the ornaments and staple the other end. Secure the staples with a mallet and bend the wire ends over the staples. Add a bow as a topper. If you’re looking for tips and hacks for your real or faux tree, don’t miss this collection. The smell of baking bread is a sure indicator of happy holidays. Mix up a batch of salt dough and use your favorite cutters and paints to make a set of colorful and durable ornaments with a DIY flair. If you can’t bear to throw out those old cookie sheets, then repurpose them by doing this. Bring the outside in with a slice of birch. Use festive rubber stamps, a wire hanger, and ribbon embellishment to convert a bit of wood into a long-lasting slice of woodsy memorabilia. Try putting these super cool coasters out for guests too. Evoke a 19th-century feel with a homemade ornament using image transfer paper, muslin, lace, and a miniature embroidery hoop. This vision of Christmas past looks lovely hanging among your blinking lights. Make sure you know these Christmas ornament storage tips when it comes time to tear down. The classic Christmas bulb is more memorable when you make it yourself. With a clear glass or plastic bulb, glue, and food coloring, you can make a set of dreamy, translucent balls for your tree or windows. Try expanding your DIY decorations to every room with these outstanding tips. Faux leather is a strong material that can endure through multiple craft processes. Cut, glue, sew, and stamp it into an interesting conversation piece that could become a family tradition. Children will love this treasure hunt idea for Advent. For each day, write a clue to the location of a treat, roll the paper into a scroll and tie it with a ribbon, leaving one end long. Put the scroll into a clear shatterproof ball ornament and glue the long end inside the ornament top, making the scroll hang inside. Number the balls with stickers and cover the tops of the ornaments with ribbon. Put your extra terra-cotta pots to good use—turn them into a Christmas tree! Paint three pots of descending sizes with red spray paint and let them dry. Then use round sponges of various sizes to add dots of green acrylic craft paint. When the pots are dry, stack them to form a tree shape and tape a coordinating bow on top. Another terrific gift for a gardener is this cedar potting bench. You don’t need any special woodworking skills to build it. Have a sofa-size painting or other large wall accent? For the holidays, remove it and use that wall space to hang small picture frames in the shape of a Christmas tree. You’ll create a heartwarming family tree of memories to enjoy all season long. Bright Idea: This wall-hung “tree” is a real space-saver for apartment dwellers. This card holder is a snap to make with wire coat hangers. Twist and bend two hangers together to form a tree, creating a short trunk and a heart-shaped loop at the top for hanging. And paint about 60 wooden clip-on clothespins green and about four more brown. When the clothespins are dry, clip them to the wire, making a green tree with a brown trunk. Tie small strips of red fabric to the wire between the clothespins for added color. All that’s left to do is hang your holiday projects on the wall, attach Christmas cards and enjoy. Project via Hometalker Holly from Down to Earth Style. Combine two favorite Christmas features, twinkly lights and piles of gifts, and create the perfect attractive and exciting holiday display. These large lit-up wooden gifts are perfect for porch decor, or for arranging around your tree. Learn how to make the Light-Up Porch Presents. Project via Hometalker Katie from Upcycled Treasures. For a simply beautiful holiday design, turn a fallen branch or collected log into a stack of slices perfect for decorating your tree. Add some graphics with this simple transfer method, or write merry messages and draw your own holiday images by hand! Learn how to make the Wood Slice Ornaments. Project via Hometalker Tammy from Deja Vue Designs. Take a break from the classic pallet Christmas tree by adding a little shine to your design. Drill holes in your pallet boards to fit twinkling Christmas lights, for authentic holiday style that would look great displayed on your porch or propped on your mantel. Learn how to make the Pallet Christmas Tree. Project via Hometalker Debbi from Debi’s Design Diary. Turn your broken or salvaged furniture scraps into whimsical Christmas tree ornaments with this awesome tutorial. Cut, paint, and hang these refinished furniture bits and bobs, for holiday decor that’s stunning and free! Learn how to make Broken Furniture Piece Ornaments. This rustic tree is made from reclaimed wood for a one-of-a-kind design that can be used in the corner of the living room or on a tabletop, depending on how big you make it. And find some wood and grab a saw, hammer and nails to create these primitive christmas tree alternatives. Is there a book lover in your home? This book tree works well in a small space decorated with a strand of mini Christmas lights. Pinterest has lots of ideas for using reclaimed wood to build alternative Christmas trees. And once completed, add some paint or stain and wrap a strand of lights around the finished project. Christmas decorating doesn’t get much easier than this. Go outside and find a branch (or you could purchase a plastic one from a craft store), place it in a vase or pot, or hang it from the ceiling or a chandelier and decorate it with your favorite ornaments. This would work great as a centerpiece or atop a living room table. If you have a fireplace and no room for a traditional tree, try decorating the mantel with some DIY tree art. Find a piece of reclaimed wood or even canvas for a backdrop, use wire to form a tree shape or simple zigzag and decorate with ribbon or strips of fabric tied to the wire. This ombre effect is on trend! An eye-catching ladder tree spotted on Pinterest may not save any space, but it is certainly a new take on a traditional Christmas tree. Try decorating with sparkly ornaments, some strands of lights and a star or angel on top. This tree is made from sheets of birch plywood with stars cut out for modern Christmas tree alternatives. Search for “plywood Christmas tree patterns” online for dozens of additional options. And a scroll saw works best for cutting the large pieces of plywood for a tree this size. This felt tree is a great project to get kids started in DIY. And not only do these types of Christmas tree alternatives work great in small spaces, they also work in a child’s bedroom. If you have a chalkboard painted wall, why not draw a tree on it during the holiday season? You can also use a small chalkboard to draw a Christmas tree and hang it in the living room. This tree uses items found at the beach for a unique take on Christmas tree alternatives. So get your hot glue gun out and try using pebbles, star fish, driftwood, pine cones and other beach finds to recreate this look. Each year Michaels Makers get challenged to come up with the best Christmas tree decorations. Over at The Paper Mama they decided to get wordy with their tree and create the punny christmas tree. Read all about our Christmas tree safety tips. Tater Tots & Jello writer Jen Hadfield came up with this advent calendar Christmas tree decorating idea. We can’t wait either to count down the days to Christmas with these tree decorating ideas. Getting ready to decorate your tree? Untangle those lights and find out how to replace Christmas lights. Michaels Maker and real mom Barbara designed this Christmas tree decorating idea for her California home. There’s nothing wrong with unwrapping gifts al fresco. Make sure that tree lasts a long while with our Christmas tree tips. AKA Design blogger Shannon Acheson incorporated ribbons with black and white ornaments to create a striking Christmas tree. Throw in the goody bags above the fireplace set up for the 12 days of Christmas and you’ve got a complete space for the holidays. Add a homemade bow to your gifts this holiday season. Pinecones and gold ornaments sparkle on this tree from Craftberry Bush. Find a way to store Christmas ornaments easily with our hints. This optically stunning creation from Skip to My Lou looks great at night. With some glitter accents and fake snow this tree can light up a room. Some thick black and white ribbon courses around this tree from Just Destiny Mag and the black and white ornaments complement the tree. Mix in the cute sleds and this tree has a lot going for it. Get some holiday decorating tips to get you step up for the holidays. Taryn Whiteaker picked up wooden ornaments to create this beautiful tree. The white ornaments continue the white motif and a strand of black and white ribbon breaks up all that white perfectly. Check your Christmas lights with a Christmas light tester. If black and white Christmas tree decorations are too much of a contrast, check out this blue and white tree from Kate Riley at Centsational Style. Find out what to know about LED Christmas lights. Instead of using just two colors, expand it out to create a colorful Christmas tree like this one at the Bauer Power blog. Check out the use of the curled up pipe cleaners, too. Find a quick DIY gift idea to put under that tree this holiday season. Some times you don’t have to go to great length to find the right accent for your Christmas tree. This tree at Just Destiny Mag used socks to create garland. If you plan to pick up your own tree, learn how to cut down a tree safely. This plaid ribbon is dressed up a little more with a snowflake design to give this tree from A Pumpkin and a Princess the white accent that matches the frosted branches. Got a gardener in the family? Find the perfect gift for a gardener with this ideas. Want to sweeten up Christmas even more? Try out this Candy Land-inspired tree. Check out the faux gummy bear tree topper, along with the lollipops, candy canes and popsicle ornaments. Save some cash this holiday season with Christmas cost cutting tips. The Crafting Chicks tucked in some gold snowflakes to break up the white of this tree to make it sparkle. Gold garland added in gives it an additional glimmer in the right light. Get some shopping ideas if you have a hard time finding the perfect DIY gift for the handy person in your home. If you don’t want to overwhelm a room with color, find some lighter pastel colors like this tree from Cuckoo 4 Design. Add a pop of magenta to keep it from getting too dull. This tree also features a foldable star tree topper that can make it stand out. Get some inspiring ideas for holiday wreaths outside. If you ever wanted to anthropomorphize a Christmas tree, this would be the first place to start. Your tree will surely stand out with this peacock-inspired tree. Keep your home clean during the holidays with some hints. Amy at Atta Girl Says opted for a classic look with this Christmas tree. She made sure to include a lot of family ornaments and found a way to balance it out so it doesn’t look cluttered. Find what your fixer-upper needs in their toolbox this Christmas. Create a rustic look that will make it feel like you’re having Christmas at the cabin. Using plenty of brown and gold colors, this tree incorporates cork tags, decorative potpourri, grapevine balls and silk flowers for a classic look. Find the right DIY gift for under $50 this season. At DIY Showoff they introduced some cardinals throughout the decorations of this tree. It creates more of a natural effect and works in well with the green and red plaid throughout the tree. Build a backyard birdhouse for those real cardinals. A beautiful burlap bow atop this Christmas tree decorating from Love Grows Wild ties things together perfect. The light colored brown burlap highlights the wood of the tree and basks in the glow of the Christmas tree lights. Use some extra burlap for wreath ideas. The animal kingdom gets pretty well represented with this tree from Decor Asylum. From owls cut from wood and reindeer on burlap ribbon, there area lot of characters cropping up in this tree. If you’ve got some unwanted guests in your backyard, learn how to get rid of pests. This Jeweled Forest tree design from Design Dazzle is a reminder that you’re tree topper can really be anything you want. This tree uses a silver birdcage to top it. The tree added several shades of green: sage, jade, apple and mint. The ornaments add some glitter and the moss gives a bit of a habitat for the birds. Give the birds of your backyard a clean bath by learning how to clean a bird bath. Dollar store dusters dressed up this tree from Craftberry Bush to give it the look of a fresh, heavy snow. The dusters were arranged perfectly into the gaps and crevices of the tree. Find out how to transform ordinary items into the extraordinary. A distressed rooster weathervane, burlap and farm-related ornaments give this tree from Ashley Hackshaw at Lil Blue Boo the quintessential rustic farmhouse charm she sought. Want a weathervane of your own at home? Learn how to build a cupola for a weathervane. What’s better than having a pair of old skis around for Christmas decorating? They’re a perfect antique feature in any home and as a tree topper for this tree from Love the Day it works, too. The antique wagon adds charm to the flocked tree and check out the tiny cottages that hang from the branches. Find out how to refinish furniture if you have some antique items that need some work. Hike on over to Lil Blue Boo to get a chance to roast marshmallows after you get off the trail. This hiking-themed tree knocks it out of the park. It comes completes with tiny canteens, plaid backpacks, thermoses as ornaments. Find out what you should’ve known about camping that you don’t. Keep your eyes peeled for certain creatures with this deer-themed Christmas tree from Lia Griffith. This big buck is a pretty neat touch to a Christmas tree and gives people something to marvel at that is out of the ordinary. Build a maintenance-free fence to keep the real deer from chewing up your garden. You might not think it but antlers on this tree from U Create make it really pop. The faux snow surrounding the antlers and a distressed deer head ornament create a rustic charm few others have thought to design. Succulent garland, pinecones, pheasant feathers and burlap poinsettias make this tree a cornucopia of Christmas tree decorating. Potted succulents line the burlap tree skirt to further the theme of this tree. Add some succulents to your garden in the spring. From A Thoughtful Place this tree uses textured ribbon to add to the cable knit theme. A cable knit throw pillow sits on the chair and a cable knit blanket sits on the stairs. The color scheme of the tree remains simple with shades of white and cream. The cocktail part of this tree comes from a salted caramel apple cider cocktail served around the tree. Get some ideas for a home bar or liquor cabinet for your home. Make It & Love It blogger Ashley Johnston went big and bright with this design. She mixed in big silver stars along with silver letters to spell out “merry” and “bright” on her tree. She sprinkled in some frosted pinecones to complement the silver color scheme as well for a tree that sparkles. Blogger Jade Harrington created her own deer antler ornament by combining different elements to create a unique glittery feature. She glued antlers to an ornament ball and added a block of wood with yuletide sayings. She also added in interesting ribbon that resembles tinsel in a way. It might be cold out but this tree is sprouting magnolia flowers as part of its decorations. This tree from A Thoughtful Place brilliantly breaks up the white of the flowers and snowflakes with bright red Christmas bulbs. This tree from Clean and Scentsible used white artificial berries like ribbon to wrap around the tree to create a new look. The red tree topper and little ornaments break up the white well. Sugar Bee Crafts blogger Mandy Beyeler went away from traditional looks to create a floral design for her Christmas tree. The spiral garland layout of the faux flowers keeps your eye moving without getting districted by loads of ornaments. Find out how to take care of plants in winter. Some birch on the fireplace mantle is just one of the subtle features of this tree from Giggles Galore blogger Mariah Leeson. She blended rustic farmhouse charm with metallic ornaments for an eye-catching design. Lots of gold with some powder blue and white berry garland make this tree from Sand & Sisal glow. Also scattered throughout the tree are seahorses and sand dollars to provide the coastal motif. Gingerbread men come alive with this fantastically sweet Christmas tree from A Thoughtful Place. Candy cane ornaments and popcorn garland will have you hankering for Christmas dinner with this design. Photo: Courtesy of A Thoughtful Place. Pinecones and twig balls make for a classic, rustic feel with this tree. It mixes in a gold ribbon and gold ornaments for a glowing effect. Hanging pictures of favorite memories on the Christmas tree is a cute way to get nostalgic with family. This tree from the Aunt Peaches blog does just that while incorporating cascading ribbon. This tree even used old ties as a tree skirt. This tree featured at Inspired by Charm doesn’t shy away from color in its design. It spirals down the tree as you imagine the different color combinations that exist. White House Black Shutters blogger Ann Marie Heasley served as head cheerleader on this pompom infused Christmas tree. Heasley built a gradient pyramid of bright colors with the pompoms and led cheers for the family with pictures as ornaments. This tree at Just Destiny Mag takes a classic look and twists it a little with its ornaments. It prominently features silver bells but adds lanterns and flags to its flocked picks. Silhouettes of a little drummer boy take the old favorite holiday song and brings it to life on this tree from Kara’s Party Ideas. The silhouettes stand out but the drum and drum stick ornaments make this a complete tree that carries out its theme perfectly. Natural willow and twine went into the design of the ornaments for this impressive tree from Lia Griffith. Wooden baubles were built from wooden balls and felt garland drapes the tree for a smooth white and gold look. Classic plaid is pretty with some textured golden ornaments and frosted branches. The DIY Playbook did it right with a timeless decoration. This tree from Giggles Galore glams up the traditional role of ribbon with a billowing, flowing decorating idea. The light brown works with the burlap bow atop and running reindeer ornaments. A little robin’s egg blue accentuates this bird-themed tree from Sugar Bee Crafts beautifully. Mini birdhouses dot the branches and a crate is used as part of a tree skirt to complete the design. A Rustic wood marquee star adorns the top of this tree from Hello Life which makes the glow of the tree that much brighter. Ornaments also include old style skeleton keys and a faux snow globe as the alternating ribbons fit snugly around the tree. This Christmas Tree from Lil Luna says something with its bunting banner that spells out merry, joy and peace. It makes the large picture ornaments fit in perfectly. If you love Christmas for the plaid, then you’ll fall for this tree from Craftberry Bush. This tree adds blue and white plaid designs for a special look.The ornate mirrors add charm to the tree as well. Less is more, especially with this Scandinavian-inspired tree of silver and black ornaments. There’s no need for a tree topper in this modest tree, that would be too much jazz for a toned-down tree. A tisket, a tasket why not a basket for a tree stand? That’s the thought the people at The Merry Thought had with there Christmas tree. It helps set a pretty picture when the tree is allowed to stand out. Sure, old St. Nick gets all the attention during Christmas time but behind every great man is a great woman and Design Dazzle gives Mrs. Claus her due with this tree. 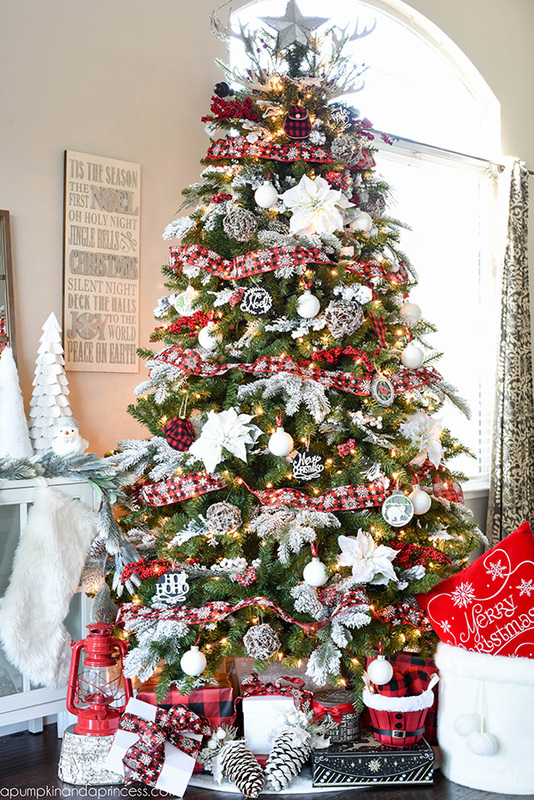 This one uses red and white check ribbon for the tree and plenty of cute ornaments. A tree with no lights might have you thinking what kind of Ebenezer Scrooge decorated such a tree but this tree from Love The Day has got so much going on, it doesn’t need any lights to shine. Let the lanterns of this Christmas tree from As Simple as That light your way to an outdoor adventure-themed tree. The ornaments are faux wood that was burned without any special tools. Pink, gold and white provide a pretty backdrop for this tree from Classy Clutter. The pink poinsettias, white hydrangeas and large pink rose stems balance the white of the paper maché deer statues and white papered gifts. This tree from Craftaholics Anonymous brings in pink decorations but adds an earthier touch with pinecones. The pink peonies get balanced out with some antler picks as well. The tree from The Clueless Girl squeezes in so many ornaments it’s astonishing. But it all comes together and makes it feel like this tree is ready to walk the red carpet with all of its glitz. It looks like a rainbow shot across this tree from A Line Across and maybe there’s a pot of gold in one of those presents underneath it. Be bold with your Christmas tree decorating and take a hint from this rainbow-colored fantastic forest creation. Announce your Christmas tree with marquee lettering like this one from Craftaholics Anonymous. It’s a neat idea though it may move a little too far away from the rustic intentions of the antler and snowflake ornaments. Gray’s a color that gets a bad rap. When it’s gray outside, it’s lousy weather, but gray is a color nonetheless and it works exceedingly well with this tree from Taryn Whiteaker. After spray painting the tree, she added wooden tags painted in various shades of gray and the gray-ish snowflake tree topper brings it home. Kara Allen of Kara’s Party Ideas has got a Christmas tree bursting with greens and red plaid. Vintage items like snowshoes and a sled complete the rustic look while the marquee letters don’t overwhelm the tree. Pinecones are sprinkled with some faux snow and tiny sleds hang from the limbs. Crystal Owens at A Pumpkin and a Princess has got the precious metals covered with her tree. The garland weaves both gold and silver together while she mixes in gold and silver ornament balls around the tree. Beaded mercury glass ornaments class up this tree and burlap poinsettias match the color theme seamlessly. Santa will feel so comfortable with this Christmas tree decorating you might have to coax him back up the chimney to finish delivering gifts. Tater Tots & Jello created a Christmas workshop with this tree with some marquee stars and lettering for the man from up North Pole way. The candy cane decorations pop up all over the tree and a red and white garland wraps around it. Simple doesn’t mean thoughtless and there was plenty of consideration giving to decorating this tree from Simple as That. From silhouette balls to paper doily garland this tree is something special. The white pictures frames continue the theme and their contents give it meaning. A fancy looking sunburst mirror ornament doesn’t need to cost you much as proven by Tatertots & Jello. A few Popiscle sticks, glue, pompom ribbon, spray paint, mirrors and coasters will get the job done. It’ll also make a tree pop. It doesn’t always take a ton of inspiration to create a dynamic tree. Check out this from By Stephanie Lynn who stayed with tradition with red tartan plaid. She mixed in prigs of juniper, iced pine and frosted fir branches for an added depth. Tatertos & Jello took on tree stand options by putting this tree is a bin. The flowing fancy frames highlight the tree and the silver balls play off the black and white photos. This geometry-fueled tree design from The Project Girl allows the tree to fill in the space between the open design of the geometric ornaments. Add in some white ornaments and cottonball garland and the white light from the Christmas lights make this a bright tree. It’s one of those Christmas tree ideas that will make you think a little. A tree like this by Positively Splendid will harken back to the childhood of many who grew up in a home with a tree that had decorations galore. In a way it resembles the chaotic balance of family with so many items but that’s what makes it perfect. It could inspire some more Christmas tree ideas and Christmas tree decorations ideas for your next celebration.